Plus can now load all custom reports and board dashboards even if there is no internet connection. 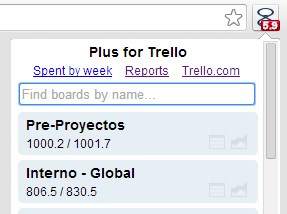 Boards chrome menu for quick access to trello and plus offline. A new chrome menu provides quick access to boards, popup reports and dashboards. Mouse-over the menu icon to see your weekly spent by day. "Spent by Week" opens the pivot inline. Click the icon top-right to pop it out. Menu items and totals only update while trello is the active tab. use tab / shift+tab to move through boards, press enter to open. When sorting by R it may not make sense to filter the report by date (week or month), as this will generate misleading R totals. To view Remaining work by board, group by board, order by R.
Similarly you may group by other combinations of fields. In particular grouping by "card-user" and sorting by R is useful to find all pending cards for the whole team. Pressing enter in a filter now runs the Query, and as a bonus it also adds the selected filter to its auto complete list. To remove items from such list, move to the item with up/down, then press shift+delete. Whenever we add a new permission, Chrome will temporarily disable the extension until you re-approve the new permissions. Manage the extension using this help.